You are eligible to renew or extend your support subscription if you have less than 6 months support remaining and the author is still supporting the item. The cost of purchasing support can vary according to the different periods of your subscription. For example, extending your support subscription while it’s still active costs less than renewing it when it has expired. To learn more about this, please read Envato’s ‘Extending and Renewing Item Support’ article found here. Step 1 – Login to your ThemeForest account and go to the Downloads tab. Step 2 – Locate your CryptApp theme purchase. On there, you’ll see how many months of support you have remaining, and beside it there’s an ‘Extend Now’ link. Step 3 – Click the ‘Extend Now’ link, and it will redirect you to the Maruthi Theme’s item page. strong>Step 4 – On the right hand side, click the ‘Extend Now and Save’ button. 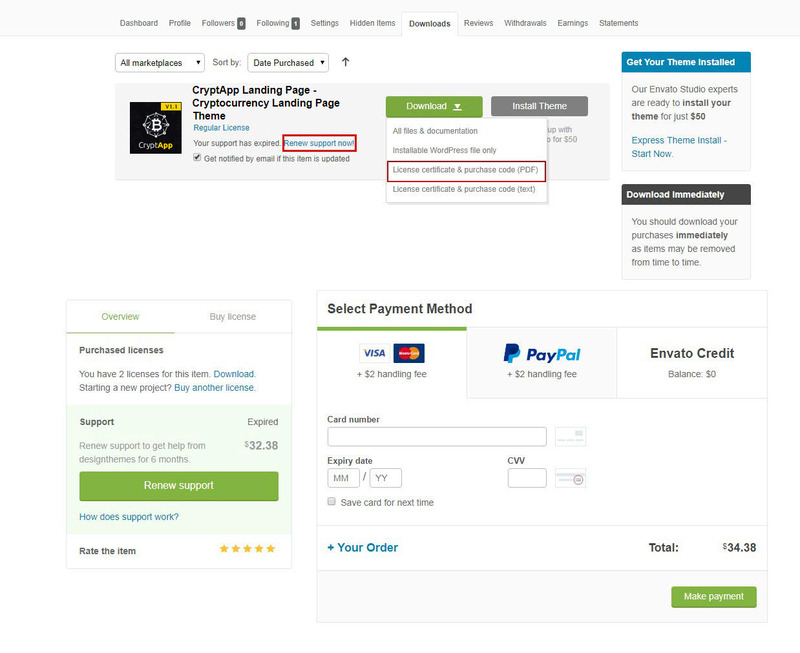 Step 5 – Once you click the ‘Extend Now and Save’ button, you’ll be redirected to the checkout page.